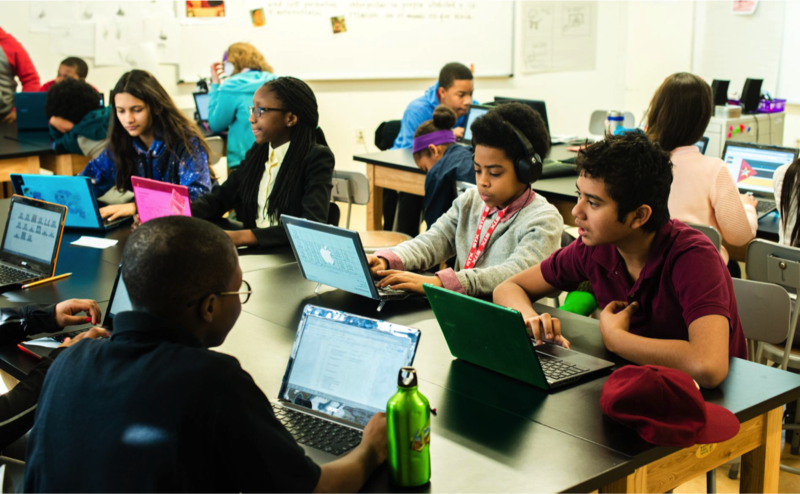 How a Breakthrough School Beat Summer Learning Loss | Education Innovation D.C.
Students on Chromebooks at DC International School. Students in America lose an average of one month of learning over the summer. That’s not a lack of progress—that’s a backwards slide in math and reading, as if four weeks of hard work by students and teachers hadn’t happened during the school year itself. This summer learning loss “disproportionately affects low-income students”—like the students who attend our school, DC International School. We are a charter school in Washington, D.C. starting our second year of middle school, with 52% of our students receiving free or reduced price lunch. We do not have an extended school year and our students did not attend summer school. But with no additional money spent, we beat summer loss. The key? Personalized, technology-driven learning. We are a 1:1 school, with Chromebooks provided to all of our students through the support of the Next Generation Learning Challenges project and the CityBridge Foundation. The students use the Chromebooks in class and take them home for homework. They keep them during the summer, too. So over the break, we assigned all students to spend an hour a week on TenMarks, a math practice program with individual learning pathways based on diagnostic assessment, and tips for students who struggle. All students also were assigned to read and respond to 40 articles through the Curriculet/USA Today summer challenge. The students could choose the articles and earn badges for their progress. The great part? All of this was free. (We don’t receive any donations or particular benefits from any of the vendors mentioned here.) We also continued to use Achieve3000, a reading intervention using leveled text that we had found success with during the school year for our struggling readers. The software makes the text a just-right level of challenge for readers, with immediate feedback (as on the Curriculet articles and TenMarks) on student responses to questions. Our students experienced no summer learning loss in either math or English. In fact, using NWEA’s Measures of Academic Progress, we found they were beating the rest of the country during the summer break. Compared to national norms, our students grew by five percentile points in math and two percentile points in reading from June to September. This addresses a huge issue in American education—and it wouldn’t be possible without the Chromebooks and the personalized learning platforms. It also wouldn’t be possible without human beings at the school—but even here, technology made it work. Faculty could track whether students were completing their Curriculet reading and used that metric as a proxy for summer work generally. Starting in the second week of summer, we called parents of students who weren’t completing the work, as well as those who were excelling or improving. (Shout-out to our awesome full-year aides who made these calls!) Think about the difference between this process and waiting until September to see if students turn in summer assignments! We also opened the school several hours a week to provide a supervised space to work for students who needed wi-fi access or just a friendly face. We have a long way to go—with math, with reading, and with personalized learning. But these results tell me that we’re on the right track. If summer learning loss can be a thing of the past, who knows what other educational fossils we can leave behind?